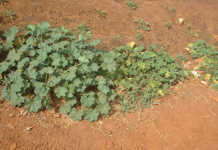 Home » Crops » Vegetables » Beware of that foliar feed mixture! 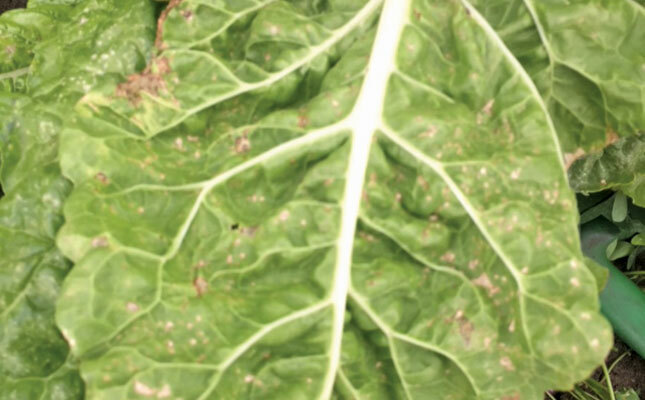 Necrotic spots developed on this Swiss chard after a foliar feed mixture was sprayed. One of their favourites is foliar feed spray mixtures, which, they say, supply virtually every mineral that a crop needs to flourish. My first experience of a foliar feed mixture was when I started working for a large agricultural estate many years ago. A highly persuasive rep gave me a thick brochure outlining the benefits of foliar sprays, complete with reports on farmer trials. It took three evenings to read, and I became fired up with enthusiasm. Due to the scale of production on the estate, I was required to conduct trials to substantiate any proposed change to its existing practices. So I laid out two trials, far apart, in different soil types, and included competitive products in addition to the one the rep had given me. I carried out the spraying personally, making sure to wet the upper and lower surfaces of every leaf every time. To my dismay, when I evaluated the trial results, not one of the foliar sprays had led to increased yield! When I presented the results of the trials to the rep, he invited me to dinner at a hotel and told me that the reason I’d seen no improvement was that I was such a good farmer! In other words, I didn’t need to spray. Years later, I consulted for a farmer who was using one of these foliar mixtures. I advised him not to do so, but he remained unconvinced. He stopped only after I began noticing symptoms of stress on the lettuce every time he sprayed. In all my years of farming, I have never seen a mineral deficiency ‘strike’ an entire crop at once; it always starts as patches on the land. 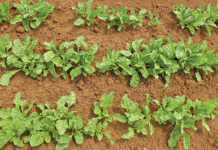 To solve the problem, you need to examine the patches, identify the deficiency, and spray the element that is lacking. 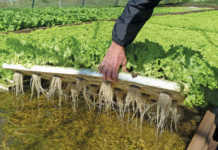 A complex foliar feed mixture contains small quantities of many elements; it does not have enough of any one to rectify a deficiency of that element. Moreover, there may be a slight overabundance of certain elements in your land; by spraying a foliar feed mixture, you can actually damage the crop. Some years ago, the Agricultural Research Council sent out at least two warnings to farmers about random foliar feeding. In addition to causing damage in certain cases, it is very rarely beneficial. A foliar feed mixture should only be used for a specific purpose, not as a ‘cure-all’ mixture that presupposes the plant is not extracting minerals from the soil. For example, in many vegetable crops, it’s advisable to apply the occasional boron foliar feed. This is sometimes mixed with molybdenum, although it’s rare to find a molybdenum deficiency if the soil is not acidic. Urea can also sometimes be useful as a foliar feed. For example, if your lettuce is slightly pale just before harvest, you can spray urea on the crop at a rate of 5kg/ ha to darken the leaves. Bill Kerr is a vegetable specialist and breeder.